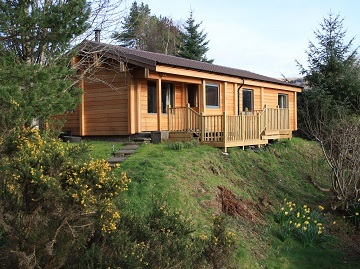 Ronaldsay is a three-bedroom log cabin located in the Seaview Grazings estate, just as you enter Strontian from the East (i.e. from the Corran Ferry). 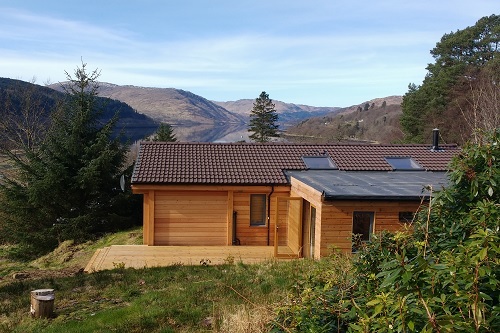 It's situated on a superb elevated site, with stunning views to the West along Loch Sunart and to the South over the loch and mountains. It's location is also very private - it sits high in the Seaview Grazings estate with no other cabins overlooking it. Ronaldsay features two separate sitting areas - each with its own TV - and a separate dining area. This gives the cabin a real feeling of space which is ideal for families. We purchased Ronaldsay at the end of 2012 and in the years since have given it a complete renovation. Season 2017 is the first year that Ronaldsay has been available for holidays. If you're interested in booking please see the Contact page, from which you can send us your contact details and see our booking options.